Details for the new Pirates of the Caribbean: Tides of War game update featuring a shadowy spin on Captain Jack Sparrow. He has been an integral part of the game with fans asking for more since the game’s release, and they are soon to be rewarded. Captain Jack Sparrow's Shade joins the game as a new Tactician for players to acquire. Pirates who play through Chapter 1 – Jack’s Memory: The Curse of the Black Pearl will be able to obtain this especially infamous new Tactician. The legendary Black Pearl will also receive a new aura effect to reflect this update. Along with Captain Jack Sparrow's Shade, 4 additional new Tactician characters are joining the Caribbean. Tactician management is also included so that players not only see Tacticians in their fortress, but their full Tactician roster as well. Key elements of the UI will also be improved. Players will now be able to check all their tasks currently in progress at the same time. Rather than needing to talk to Joshamee Gibbs each time to retrieve a quest reward, players can now simply bring up a pop-up window to receive all their rewards. There will also be a 7-day check-in event during the entire month. Eligible players who log a total of 7 check-ins throughout the month receive a fierce new Tactician, Nami Hayakaze, as an event reward. 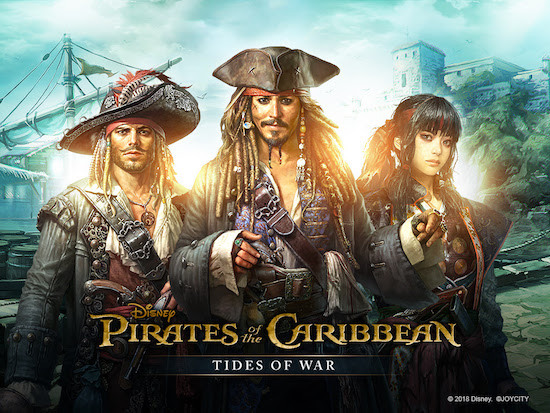 Pirates of the Caribbean: Tides of War is a mobile strategy simulation game based on the popular “Pirates of the Caribbean” franchise from Disney. The game has been enjoyed by fans all over the world since the release in May 2017.